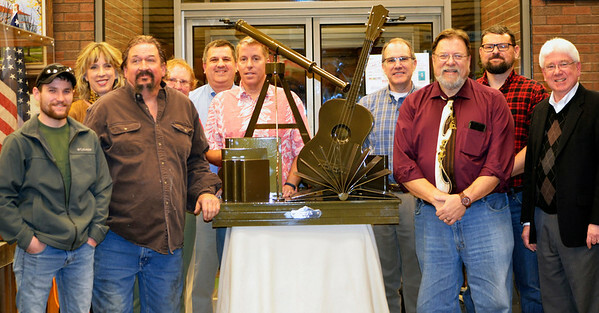 Chris Hoegeman (front row from left) and Bob Maple of Red Forge Weld, Morris, created an aluminum sculpture of Mike Kruse's favorite initiatives -- reading, astronomy and music. Library trustees (back row from left) Vice President Anne Amrhein, Nance Widdowson, Secretary Thomas Barnett, President Mark Stenger, Treasurer Peter Mack and Mark Masavage (Jeff Ollier was absent) presented the sculpture to the library in his honor. It will be installed outside the building this spring.